Healthcare events can be fun too, the interactive way! 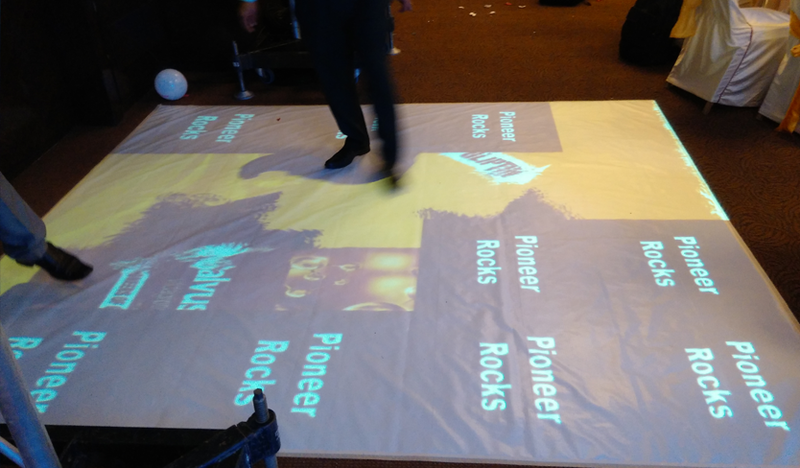 MotionMagix™ Interactive Floor at Novartis’ event creates interactive entertainment. Objective: Entertain guests with an interactive welcome. Brief: Novartis, Headquartered in Basel, Switzerland, is a world leader in the research and development of products to protect and improve health and well-being. The company has core businesses in pharmaceuticals, vaccines, consumer health, generics, eye care and animal health. For an event, they wanted to enthrall guests with a captivating welcome. Our Tile Flip effect for MotionMagix™ Interactive Floor was implemented to serve their purpose. In this, a cluster of tiles that first appear still, flip when interaction in the form of footsteps taken occurs! This amusing effect is actually a dual effect, where first tiles appear still on the projected area, upon touch, these texture tiles flip, to blue colored files with fish going around and ripples being formed. Thus creating the much objected entertainment at visitor’s welcome. Impact: The audience left captivated with an unforgettable experience.